Fabulous Cocos Island diving. Contact Janet for booking information. We work with the best liveaboard ships and crews in the world. Make sure you check out our Liveaboards page. Dive Travel Services plans anywhere from four to eight group dive trips per year to locations in the Caribbean, Bahamas, Pacific, etc. We can also plan your individual dive vacations with 2, 20, or 200 persons. Some trips use land-based dive operations. 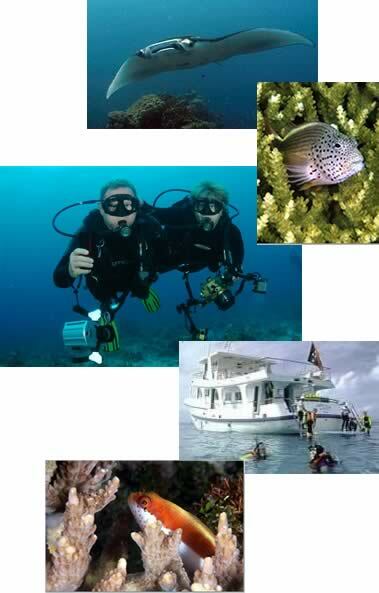 Some are on liveaboard dive boats (eat, sleep, dive, eat, sleep... dive) . Some Pacific trips are a combination of both. Group trips to exotic Asian/Pacific/Oceana destinations always have a land portion included. This allows you to absorb some of the local culture and also adjust to the time changes. Be sure to visit our Trip Reports page for details and photographs from past trips. For more information on any of our upcoming trips, please call Janet at 248-442-2772 or email her at trips@divetravelservices.com for more details. One week aboard the luxurious 115-foot Explorer II, cruising and diving the beautiful Caribbean waters of the Turks and Caicos Islands. Unique resort in Sandy Bay, Guanaja, Honduras. Join Sea the World at CoCoView Resort for another trip to “Dive Camp”! 7 nights at Capt. Don's Habitat resort, Bonaire. 9 nights at the Lembeh Resort in Sulawesi, Indonesia; 4 nights at Murex Bangka, Bangka Island. 30 guided boat dives including NITROX.